It’s time to bear witness at the Orwellian “Maple Lodge Farms” chicken slaughterhouse in Brampton. This is Canada’s largest chicken slaughterhouse killing half a million precious chickens a day! There is also Maple Leaf ‘poultry’ slaughterhouse in Toronto killing 60,000 a day. 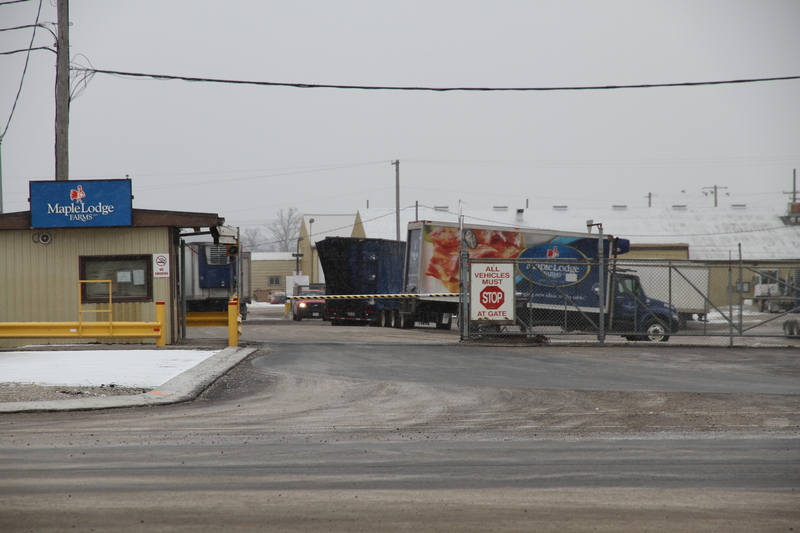 On January 30, 2012, we attended the court proceedings in Brampton in which Maple Lodge Farms is being prosecuted by the Canadian Food Inspection Agency (CFIA) on animal welfare grounds. During the cross examination of a former Maple Lodge quality control manager and truckers, we learned many sad and shocking facts. We learned a great deal from two truckers who took the stand and were cross-examined – the first time we heard transport truck drivers reveal all. The facts were quite unbelievable. Maple Lodge “Farms” slaughterhouse had 41% of the chickens dead on arrival (DOA) in one case, and hundreds in other cases. The focus of the CFIA’s case is animal welfare… this is unprecedented for a big trial like this for CFIA; usually it’s health and safety issues. 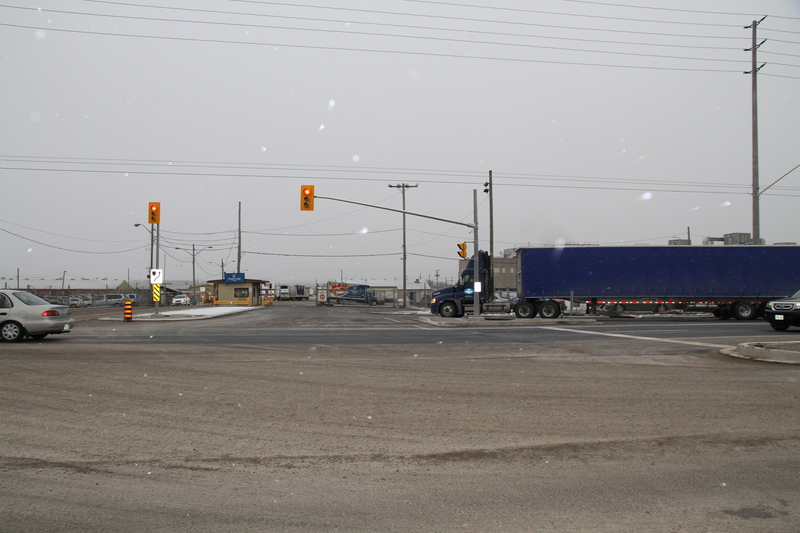 • 41% of the chicken Dead ON Arrival on one truck (almost 3,000 birds), more than 700 on another truck, and many other cases discussed of chickens travelling wet and then freezing to death in extreme cold weather at -15 degrees C or below with wind chill as they arrived at Maple Lodge Farms slaughterhouse in Brampton… and there is 80% feather loss on average! • The ‘catchers’ take less than 7 seconds to fill each crate –and there are 14 ‘spent hens’ in a crate and 12 ‘broiler’ chickens! Following the hearings we visited Maple Lodge Farms (idyllic sounding name can’t cover up what happens in that house of horrors) chicken slaughterhouse located near Steels and Winston Churchill intersection. 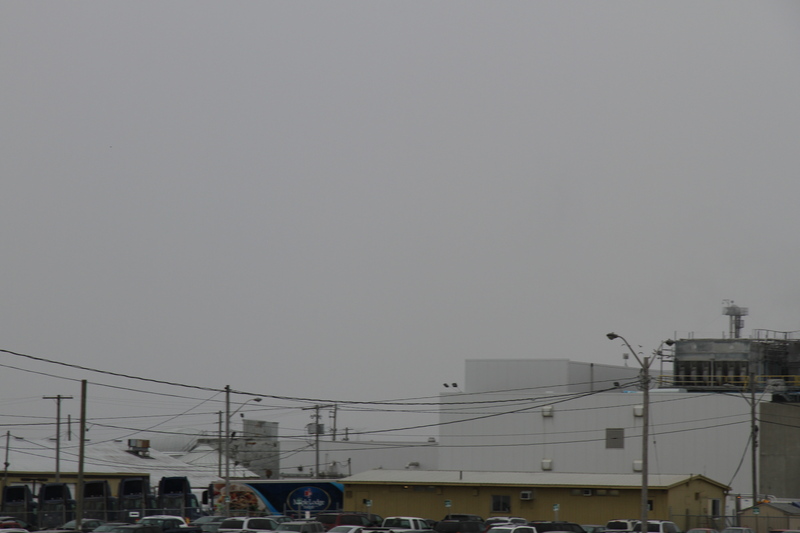 It’s truly Orwellian… One outer building has pretty wooden curtains, fairy tale-like, and there’s a Merry Christmas sign on another wall, yet it is the largest chicken slaughterhouse in Canada! • Maple Lodge has 3 ‘production lines’, one for ‘spent hens’ (these become ‘chicken dogs’), one for male broiler chickens (these larger chickens are destined for Swiss Chalet), and the other for smaller female broiler chickens (these go to KFC). There are 3 more hearings. The next court hearing on February 13, room 304 at the Brampton courthouse then other two in spring and summer… it’s well worth attending, in fact it is vital for lots of people to attend and learn first hand the suffering these chickens must endure. This is the first major trial CFIA is holding on animal welfare grounds! It’s important to attend these hearings to learn the truth of the reality the chickens live in order for us to work hard to change their situation. We can only do this by learning more about their plight and sharing this knowledge with everyone. Our mission remains to “make slaughterhouses have glass walls” so that everybody would be vegan. For background information regarding the court case, see Josh Tapper, “Maple Lodge Farms faces 60 criminal charges as thousands of chickens perish,” Toronto Star, January 8, 2012. One chicken transport truck carries 10,000 chickens crammed in.